Following a surge in layoffs in June, Wall Street layoffs plunged in July to a level that remained higher than what has been seen in four of the past six months as bank executives remain cautious about the weak market environment. New hiring, on the other hand, surged to the highest level seen since December of last year. 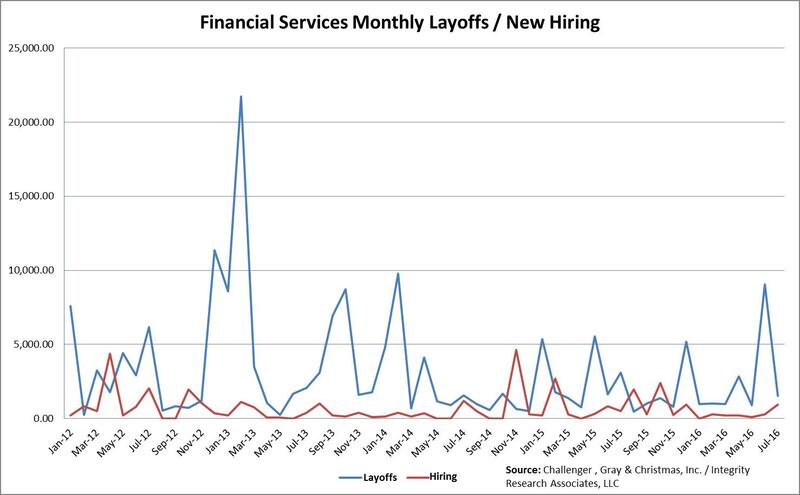 According to the July Challenger, Gray & Christmas Job Cuts Report, the financial services industry saw planned layoffs plummet over 83% to 1,524 layoffs from 9,052 layoffs announced in June. Despite this decline, the July layoff total remains higher than what was recorded in four of the six previous months since the turn of the year. The July 2016 layoff figure dropped to a level 50% lower than the 3,107 layoffs reported during the same month last year. In addition, layoffs for the first seven months of 2016 totaled 17,326 or 11.5% below the total for the same period in 2015. Consistent with the improved layoff data, new hiring in July also bounced higher as 937 new positions were available, 237% above the figure seen in the previous month. New hiring in July was 82% higher than the figure seen in the same month in 2015 when 516 jobs were made available. Over the first seven months of 2016, new hiring totaled 2,015 new jobs — 59% below the 4,861 new jobs offered during the same period during 2015. As you can see from the above chart, employment conditions on Wall Street remain fragile as layoffs remain above new hiring, causing overall financial services employment to shrink. In fact, the last time that overall monthly employment grew was in October of last year when hiring exceeded layoffs. This development is consistent with our view that Wall Street executives are continuing to shrink their staffs as overall profits remain under pressure. In early July, following KeyCorp’s $4.1 billion acquisition of Buffalo-based First Niagra Bank, KeyCorp management promised that they would limit the number of New York job losses to 250 positions. The deal was brokered by U.S. Senator Charles Schumer and US Rep Brian Higgins to help ease fears of widespread job losses in western New York and across upstate. In an effort to address investor concerns about weak profits, Dallas-based bank Comerica Inc. announced that it will adopt a series of cost-cutting measures, including chopping 9% percent of its workforce (or 800 positions) and close 40 locations, to bolster its bottom-line. These moves are projected to save the company $160 million by the end of 2018. The plunge in layoffs and the pickup in new job openings in July could be seen by some as evidence that the Wall Street employment outlook is on the mend. However, we don’t agree. We see the July improvement as merely a temporary rebound from extremely poor June data. The fact that net employment on Wall Street has shrunk for nine consecutive months suggests to us that most bank executives remain cautious about increasing their headcount due to low interest rates, weak fixed-income and equity commission revenues, anemic IPO volumes, and increased regulatory changes. All of this leads us to believe that very few investment bank research departments and independent research firms will be hiring aggressively any time in the near future.